Today I am a part of bloggers Unite for Haiti. We are as bloggers trying to help with aid to Haiti in our own way. I am sure that you are well aware of the over-all situation in Haiti. First, I would like to point out that though I am currently in the Eastern Hemisphere, there are people in Haiti that I know and have known for quite some time. When you work with the UN as much as I have, this is something that happens. The "Little Miracle" story of Tarmo Joveer is an example of what I am talking about. I have known Tarmo since around 2000. He was a part of the Eastonian Police Contingent that was deployed to the UN Mission in Kososvo. I remember their first official day and I met all 5 contingent members. Later on I joined with them in Eastonian Contingent meetings and felt a close camaraderie to them. 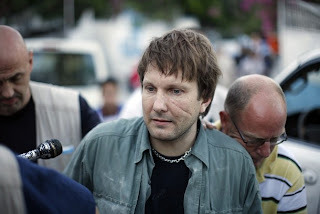 I remember when Tarmo left Kosovo he said he was getting a security job in Haiti. That was really the last real contact with him. When I saw him on TV I knew it was him immediately. I am glad Tarmo is a part of the good things that are happening in Haiti. The road is long and hard to any kind of “recovery” for the people of Haiti. They hardly had anything before, and now what was there is all but destroyed. So please donate if you can to relief efforts. There are some good sites that have various lists of ways that you can donate. One is Its Just Light which has a mirror page on Facebook . If you have doubts as to where to send donations – send to an organization that you already know and trust. This will take a long time for Haiti, but for now just getting essentials to people can be a real issue. God Bless the people in Haiti – and be Safe!